There are shows, and then there are phenomenons. RENT is a phenomenon. Now, being popular does not necessarily equate to being a good show or even being quality material. In RENT‘s case, the two happen to coincide. The popularity is balanced with a story and a “realness” that the happy-go-lucky musical genre doesn’t always tackle. Still this “realness” does not go that far. After finding my seat in the La Mirada Theatre Performing Arts Center, I looked upon the massive set and was impressed. The building in front of me was meticulously crafted to look grimy and unkempt yet incredibly clean at the same time. It’s hard to ignore the obvious metaphor. 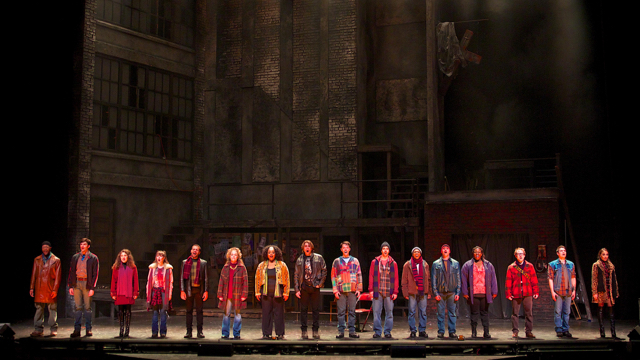 RENT takes us on a voyage into the world of the unfortunate but doesn’t actually live there. I believe that’s part of its appeal. With an exceptional group of actors/singers, McCoy Rigby performs a clinically perfect version of RENT that will satisfy most but lacks the grit that could push the material further. RENT is the story of bohemian artists living in New York during the end of the 80s (the “end of the millennium” if you will). 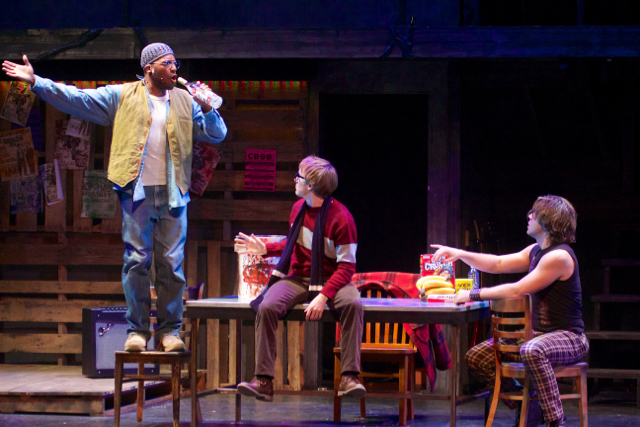 The show may be called RENT, but money is only one of the many deep issues this play handles. In this rock musical we follow characters dealing with AIDS, relationships, drag queens and human issues in general. is a beautiful stripper, and she dresses to the T, flaunting herself in every scene– which is probably why we forgive her for many of the horrible things she does in RENT. Not only is she a drug addict but Mimi’s character also has very little moral conviction besides her own self-interest throughout the entire play. I’m being deliberately vague because it’s a spoiler, but if you watch the show pay attention and you’ll eventually see what I mean. It’s really hard for me to like Mimi’s character, though I do. She’s one of those people I would hate in real life, but on the stage I can’t stop watching her. Whether attributed to her sexuality or confidence, Cassie Simone (Mimi) has it. Solid performances all around. There are a few mistakes, though if you blink you might miss them. One of the recurring errors is that some of the actors appear to be so so invested in their singing that the acting loses some of its luster. Just sitting there you can hear what songs and moments really strike a chord with the audience. Examples include “Seasons of Love” (aka the song everyone –even people that haven’t seen RENT –know) and “Over the Moon.” While “Over the Moon” is fun and incredibly silly, it may be the most important song in Rent. Jumping over the moon becomes a way of symbolizing the almost impossible struggle people in these situations face in order to reach equality in a society that –as Maureen puts it –won’t let them produce milk. This “milk” could be a lot of things, but in the context of the play, I believe Maureen is talking about art and the struggle to make art when you’re trying to survive. Which begs the question, how much does society really value art? 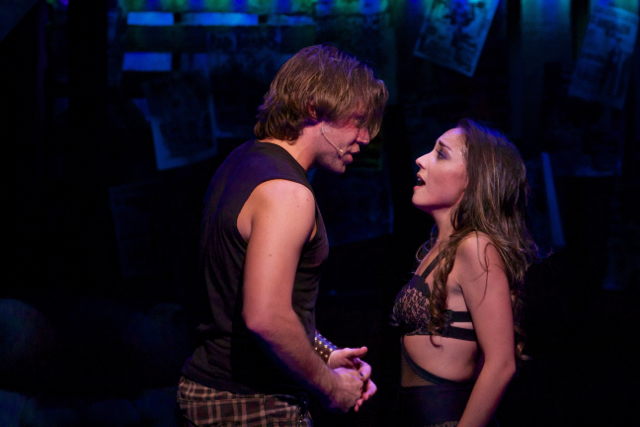 McCoy Rigby’s production of RENT has all the right elements, but it lacks that gritty punch from the vocals and overall performance. So what I’m saying is, you’ll love it. Larson, Jonathan. Rent: The Complete Book and Lyrics of the Broadway Musical. New York City, NY: Applause Theatre and Cinema Books, 2008. Print.